Record-shattering cold, heavy snow and howling winds are descending on a broad swath of the U.S., the National Weather Service says. It’s the result of one of the coldest arctic air masses to hit the country in recent memory, the agency says, forecasting bitter conditions in areas from the Upper Midwest to many Eastern states. “Keeping Michiganders safe during this stretch of dangerously cold temperatures is our priority,” Whitmer said. 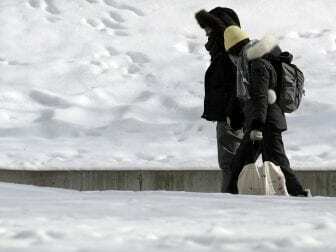 “When it gets this cold, nobody should be outside unless it is absolutely imperative for them to be outside,” Douglas Brunette, an emergency room doctor at Hennepin Healthcare, told Minnesota Public Radio. Farther east, in Buffalo, N.Y., the city’s public school district canceled classes for Wednesday and Thursday and told school staff to stay home, citing the forecast of “heavy lake effect snow, winds, and extreme cold.” Other nearby districts were making similar plans, as member station WBFO reports. A winter weather advisory went into effect at 4 a.m. Tuesday in Baltimore, where health officials declared a “Code Blue” emergency through Friday morning. “The designation prompts agencies to offer free meals for senior citizens, encourage homeless people to seek shelter and help residents apply for utility bill assistance,” The Baltimore Sun reports. In the Southeast, predictions of perilous weather prompted Delta Air Lines to cancel 170 flights out of Atlanta on Tuesday. Member station WABE’s Susanna Capelouto says it was a pre-emptive move and that travelers will be allowed to change their flights without a penalty. Alabama Gov. Kay Ivey declared a state of emergency for all of her state’s counties Monday, well in advance of the brunt of the storm. As member station WBHM reports, many school systems and city and county offices have since been closed because of expected snow. “Due to the extreme cold and heavy snow predictions, all crime and doing really dumb things has been cancelled until further notice,” the Priceville Police Department in Alabama joked in a post on Facebook.